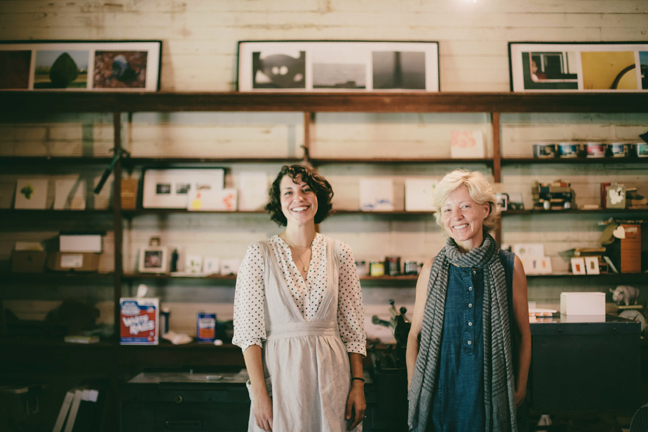 Brown Parcel Press is a small letterpress and design shop powered by four hands. Megan Fowler and her Breton mother, Gaelle Boling, run their studio together out of a 1920's general store situated on the farm where they live and work. With an emphasis on quality, touch, and the beautifully simple things in life we strive to produce paper goods that are playful, smart and striking. Why Letterpress? Letterpress delivers the best results, period. It is a centuries old printing technique that yields a visible impression on the paper. This impression gives printed information a crispness, clarity, and elegance you can't get with digital printing. There is a connection produced with each piece of paper that runs through the press. We print on either our Vandercook or C&P. Still curious about how we ended up in the hidden jewel of Georgia (seriously, that's our county's motto)? See the unabridged version below or check out this video. Brown Parcel Press began after Megan took a letterpress class in college and got hooked. Seriously hooked. Deciding not to wait for graduation to begin her career, she launched the press in 2007 with the help of a friend. Printing on nights, weekends, and holidays in a shoebox studio Megan began honing both her craft and her voice. After graduation the girl, the company, and the press moved to Brooklyn... unfortunately her heart stayed in Georgia. So a return to the South was imminent, and at the end of 2009 the press moved back to GA, but this time it found a new home. A 1920's general store on a 200+ year old farm became, and still is, home for Brown Parcel Press. With both her heart and company in the same place, and with a new found love for farming, Megan and her husband set about building their dream. What they didn't realize was that the dream was about to include a new edition. In 2012 they welcomed their first little bundle into the world! When Megan's pregnant belly got too big to keep from bumping into the press while printing, her mom, Gaelle, offered to be an assistant. Little did either of them know that that assistant had some serious printing talent and an uncanny eye for color. So, at the beginning of 2013 Gaelle came on board full time and is now an integral part of this little studio. Huzzah! At the end of the day, Brown Parcel Press works tirelessly to produce paper goods we can stand behind... or in front of. So what if they've always got ink on their hands from the press and dirt on their knees from the pigs.... there's no one around to see but the chickens.